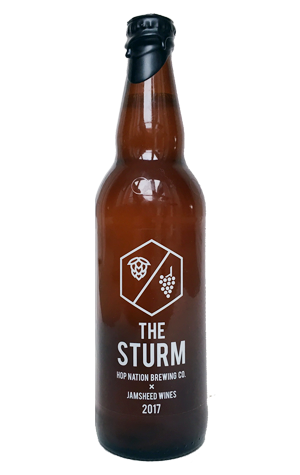 The Sturm is the beer that, perhaps more than any other, highlights the story of Sam and Dunc at Hop Nation. They're winemakers turned brewers and this is a wine meets beer kind of a beverage, one named after the low alcohol fermented grape juice traditionally consumed in Germany during grape harvest. This is the second year they've made it, again hooking up with Jamsheed Wines to get their hands on some wild fermenting Riesling juice – more than in 2016's debut brew – and combining it with a small batch of their pilsner wort. They managed to get hold of all the German hops they'd intended for the first brew this time, meaning fruity new variety Hallertau Huell Melon is in the mix too. This unique combination results in a hazy pale yellow pour from which you'll pick up pithy grapefruit and citrus aromas and a dry, acidic, herbaceous finish alongside familiar pilsner malt flavours. If you read this in time, you can join them for a tasting at Paradise Alley in Collingwood, from 4pm to 6pm on June 3, with Sturm infused bites and records spinning.